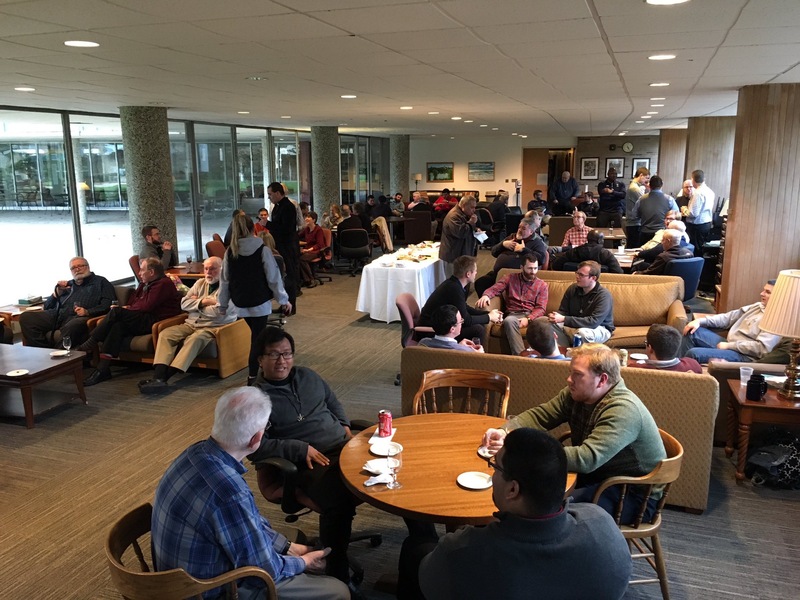 We began Thanksgiving Day the way that we do most days here at Moreau Seminary: with prayer. We give you thanks, for all your benefits Almighty God, who live and reign forever and ever. Amen. Thanksgiving is the time that a lot of families come together. If your family is anything like mine, one small house suddenly becomes stuffed with people milling around, cooking turkey, warming up casseroles and dishes brought over by aunts and uncles, and the game begins of trying to make one long, winding, weaving table. There’s an atmosphere in my parent’s house that, growing up, always left me feeling full: full of food, for sure, but also full of gratitude, full of warmth, full of family, full of love. Being away from such fullness can leave me feeling a little more empty these days, now that I cannot always get back to my parent’s home over Thanksgiving. We who are vowed religious in Holy Cross have a document which we call our “Constitutions”. This document models for us how we are to live our religious life and in particular, what our religious life in community is supposed to look like. In these Constitutions, we are reminded to become “men who have, for love of their Lord, become closest neighbors, trustworthy friends, brothers” (4.42); men who “will have most to share with others by dwelling together as brothers” (4.40); in short, we are reminded to become a family. A tall task it is then to bring together men who are all brothers, uncles, cousins to different families! But what I’ve come to appreciate more than anything is that while family might look different in Holy Cross than it is in each of our own individual families, we come together not because we’re simply nice to one another or ‘it’s a good thing to do’, or ‘because Jesus tells us to love our neighbor’. That’s not why men in Holy Cross profess vows and live in community. We live in community as brothers…for love of our Lord. And that’s why most days begin in prayer here at Moreau Seminary, and why Thanksgiving Day is no different. Because we forget how important our love for the Lord is in sustaining this endeavor to make a family out of strangers. We need to be reminded that what we learned in our families growing up about feeling full should carry over into our family of Holy Cross. 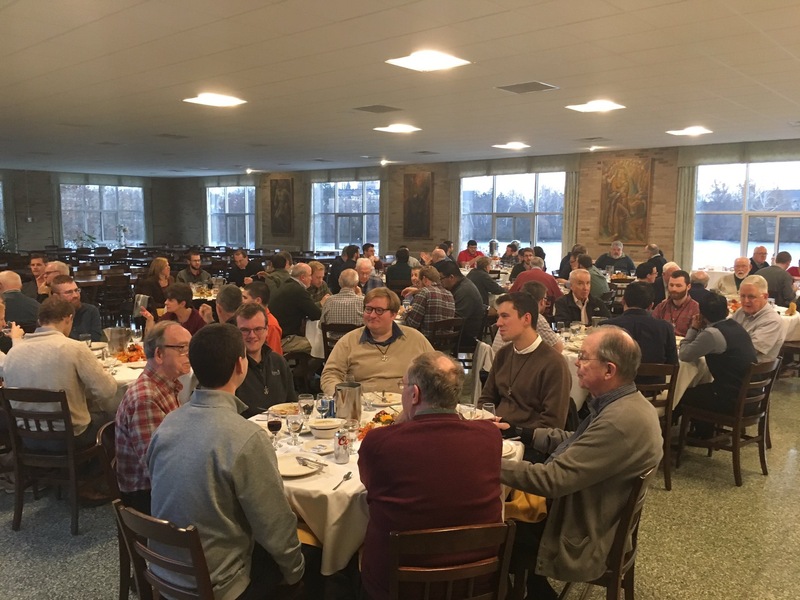 And the only one who really gives us that “feeling full” is the One who brought together our immediate families, and brought us together to become brothers (and belong to one another) in Holy Cross. We give you thanks for all your benefits Almighty God, who live and reign forever and ever. Amen. Andrew Fritz, C.S.C., is in his second year of temporary vows at Moreau Seminary. Andrew spent last summer ministering to the guests of André House in Phoenix, Arizona. When he is not studying for his M.Div. Degree, Andrew enjoys lacrosse, singing, playing the trumpet, making things out of clay, and beatboxing. He is originally from Columbia, Maryland.